Sewing is my hobby, but it is a lifeline for some women. Celebrate my 60th birthday with me by helping 60 women own their own sewing machine. Thank you for making their dreams come true! I want to help someone earn a living by sewing. God bless you all! Hi! I hope this helps your mission. Awesome way to empower women! Many poor families in South Asia don’t make enough money to provide for their daily needs. Sewing machines offer those with no education the opportunity to make enough income to feed the family and to send their children to school. Your donation will enable Gospel for Asia to provide sewing machines to families in need. Every $85 is enough for one sewing machine. Training classes are also given, so each sewing machine can be put to good use. 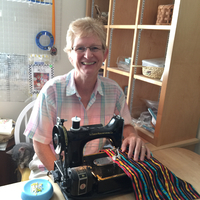 "I want to help someone earn a living by sewing. God bless you all!" "Hi! I hope this helps your mission. Awesome way to empower women!" Wonderful idea. Many happy returns, Laura! "Wonderful idea. Many happy returns, Laura!" "What a wonderful way to celebrate turning 60 - glad to be a small part of this -"
This is a wonderful campaign! "This is a wonderful campaign!" Glad to be a small part of this. "Glad to be a small part of this." Happy birthday, from a fellow GFA blogger. "Happy birthday, from a fellow GFA blogger." Happy Birthday Laura. What a fantastic way to share His LOVE! "Happy Birthday Laura. What a fantastic way to share His LOVE! " What a wonderful goal! My Mom loves to sew and so do I, may this little bit help your campaign! "What a wonderful goal! My Mom loves to sew and so do I, may this little bit help your campaign!" Merry Christmas! We love you! "Merry Christmas! We love you!"